iOS Apps, News and More! 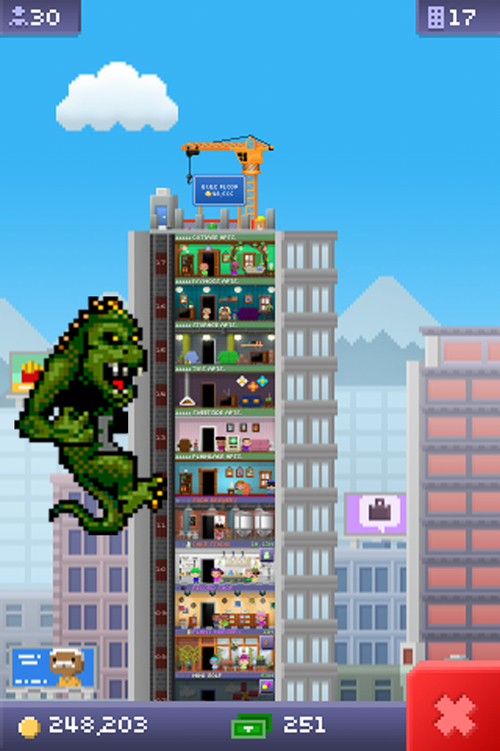 Posted below are some Tiny Tower tips and tricks I've collected all over the interwebs to guide you in building floors, stocking stores and operating elevators in Tiny Tower. What if tiny digital people could live inside your phone? Something like a tiny tower building underneath the glass! 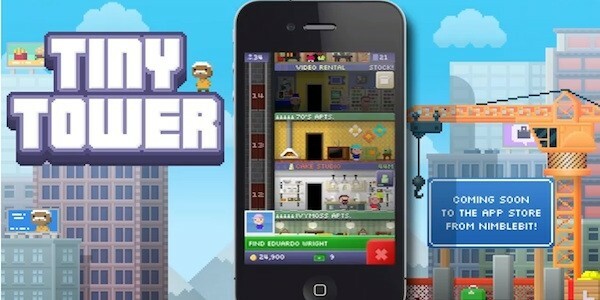 Tiny Tower is the latest freemium game from Nimblebit (of Pocket Frogs fame) that lets you build a tiny tower and manage the businesses and bitizens that inhabit it! ★Make money to build new types of floors and attract bitizens to live and work inside. ★Special events and VIP visitors will earn you special perks as you build your tower towards the clouds. ★Customize the look and placement of each floor and the bitizens that live in them, and upgrade your elevator. ★Game Center integration to let you see your friends towers, back up your game and earn awards. ★See what is on your bitizens' minds by peeking at the "BitBook" virtual social network for your tower! Bitizen costumes are coming soon! Woot woot! You build your 1st residential floor and your 1st production floor, move in your first bitizen and give them a job. You earn coins by having your bitizens get to work and creating items to sell. You spend those coins on building more floors and eventually your tower will be sky high. #1 The fastest way to get coins is to grind until you get 50 tower bux, then buy the 100k coin package. With around 1 hour of gaming time, it is possible to get 30+ tower bux and 6 floors. #2 Bitizens will never move out on their own. Employee skill levels affect how big of a discount you get on restocking products. #3 The more bitizens working at the businesses, the more products you can sell at once and the more money you earn. #4 Always fully staff a business before moving to the next one. Always have ample residential floors. #5 You get tower bux for doing various tasks during the game which can fast forward any stock/build time you have. #6 Match the jobs you assign to Bitizens to their job-skill ratings. Don't shy away from evicting Bitizens whose skills don't fit into the vacant floors you have. #7 For an initial boost, save up 50 cash and trade it for 100,000 gold. Instead of spending cash to speed things up initially, sacrifice your first day's gameplay by waiting for constructions and restockings to complete by themselves, while transporting Bitizens on elevators manually to hoard up your bux. #8 To help with the above... get into a habit of saving cash! Bored of transporting Bitizens up and down the elevator? Multi-task out into a game of NBA Jam, lap of Real Racing 2 or match of First Touch Soccer and come back while your floors are being built or items are being restocked. #9 Make sure all of your shops' three employment-slots are filled with skilled workers. Keep your floors fully stocked with items before logging off or taking a break, letting you sell maximum stock while away. If you're 15-20 stock away from hitting empty on a Level 2 or 3 item, consider spending Cash to restock it fast before logging off. #10 Plan your next move. You will usually have more unemployed Bitizens in your hotel than working ones initially, since only 3-slots exist per store. Decide which shop you want to open next and invite only Bitizens with that particular skill-set to stay at your tower while you save up gold for the next floor. #11 Stock all three items on any shop to get a small coin bonus. There are NO ALERTS as to when an item goes out of stock; so keep your eyes peeled! #12 You can give each Bitizen a makeover for 1 coin per change. Beware, this is not mentioned explicitly in-game! #13 Change the theme of each room by tapping on it, and then hitting paint! You start off with 100 Paint-credits which can be used to renovate any room in your tower. When you run out, buy another 100 Paint-credits for 1 "Bux"! #14 It's easier organize and henceforth, manage your rooms, restaurants and other themed-floors if they are stacked together. Tap on the room you want to shift, and hit move! This costs 1 "Bux" every time you move any floor. #15 When doing the "find a Bitizen" mini-missions, you don't need to find his exact position (a-la Where's Waldo) - just tap anywhere on the floor he or she is on! #16 It's really important to dump low skill tenants and try to keep the brightest. They will make your life much easier. #17 You only need a store to be staffed while you're producing an item. So while a level three item requires three staff members at the store to produce, once the item is produced you can move them to a different store and the item will remain at the store, and continue to be sold. I imagine you need to leave at least one bitizen at the store to keep it open. So you can shuffle level 8/9 employees around. It's super helpful while you're waiting for newly built apartments to fill up, and awesome when combined with certain stores that have HUGE inventory counts, like the soda brewery (stocks 1500 level 3 items). #18 Dream jobs double the capacities of stocks. Have 1 person at their dream job doubles capacity of the 1 coin items, 2 dream jobs for 2 coin items and 3 dream jobs for the 3 coin items. Employing someone at their dream job also rewards 1 bux. This is far more important than skill points, which only offer discounts on restocks. #19 If you don't balance your stores, the demand will go down for the type of stores you have a lot of. 5 new businesses: BBQ Place, Auto Dealer, Floral Studio, Rock Climbing, Recycling. You forgot one thing under the VIPs section. There is a person in a pink outfit with big glasses on and (if I'm not mistaken) white earrings. She temporarily increases the number of customers on the floor you bring her to. Another thing I'd mention is that once you tap on the VIP you cant check your stock on different floors, so before you do check each store's stock. That's the celebrity. - Isn't there also a real estate agent? Thanks for that. What exactly is the meaning of the numbers for individual bitizens? Couldn't figure that out fo far. Do you have a idea of the sales/profit made for each shop? Dream jobs double the capacities of stocks. Have 1 person at their dream job doubles capacity of the 1 coin items, 2 dream jobs for 2 coin items and 3 dream jobs for the 3 coin items. Employing someone at their dream job also rewards 3 bux. Hi Alexander, the numbers for bitizens indicate their skill level for each of the five categories of production floor i.e. Food, Service, Recreation, Retail and Creative. Do the number it stocks (minus any dream job alterations) coincide with the times to restock? I can't see how much of something I have while something is restocking to know where to send "big spender" (VIP) so I want to make a guesstimate. If you know, could there be a spreadsheet on that as well, please? The Construction Worker VIP takes 3 hours off. You're right Dani! Updating tip #5 to reflect this. Thanks! while transporting Bitizens on elevators manually to hoard up your bux. Upgrading the elevator to maximum seems to only speed it up and not switch it to "automatic" transport. Transporters might be in the next update. 8-) I would gladly pay $5 for a 10-floor jump button. I think #17 is somewhat misleading. If you generate a level 3 product from a floor, then remove a third worker and leave the position open, after the stock is gone the product isn't available to stock anymore until you add another employee. Not while but after you could delete but I wouldn't. It wastes time and money and you might get whatever back again. You could suggest a rewording of #17. Staff are only required for restocking not sales so I'm sure you could redeploy everyone when the floor is fully stocked and only bring them back when restocking is required. Verified: Still had sales at the Pub with no staff. I personally would avoid the constant redeployment since I like locating bitizens for bux quickly. Also redeploying someone at their dream job doesn't get you another 3 bux. Oops both bitizens got renamed after the upgrade. Achievements working now too. Woo hoo!! how do you upgrade or get the right shop? eg now i keep getting pizza shop when i really want a pub? is there any way to control or isit random building a new food floor? Melvin, I think there's no way to explicitly pick the right shop as it's completely random when creating any type of floor. ... Especially from completely occupied apartments so new bitizens can move in. If their dream job isn't in your tower, you don't want them (except perhaps to fill jobs temporarily on a new floor or if the floor under construction is the same business type as their dream job). When a new bitizen moves in, check their dream job/stats. If their stats are better than a current employee, or better yet, if the bitizens dream job is a match, evict the waste of space, and hire your new tenant. If none of the jobs fit, you must evict. Oftentimes, you will have deliveries that are in the way of placing a new tenant in their dream job. You could wait, but most of the time, it is worth it to pay the bux to hurry up the restocking. Remember that placing someone in their dream job is worth 3 bux. So even if express delivery is going to cost 3 bux, it is a push. Actually, it is better than a push because you now have that product in stock and a lot of them if delivery was taking that long. For smaller towers, it won't take too long for bitizens to move in on their own. However, for larger towers, you might want to get more aggressive and start spending bux to move bitizens in manually. Since you get 3 bux for every placement in a dream job, you only need to average one such placement for every 3 manually moved in. Granted, you are unlikely to average that until you have more than 5 different businesses for each business type and you have more than 40 floors in your tower (if I did my math correctly), but you are investing in your future. It's okay if you lose a few bux in the process. I also failed to factor in having to pay for hurried deliveries. To combat some of this, I save up, and do tons at a time. The advantage is that stores will become fully stocked, making it a nonissue. It is also good to plan to do this before you are finished for the night so all of those products can be delivered while you sleep. Eventually, most if not all of your bitizens will be in their dream jobs (I currently have 58 of 60 smiley faces), and you will move in tenants whose dream job is already taken by 3 please employees. Don't be too hasty when applying your boot to their rear-end. They are still worth 3 bux. Temporarily unemployed someone, place the new bitizen in the job, collect your pay, kick them out, and rehire the former job holder. When you evict everyone who is unemployed, it makes it much easier to deal with a bitizen that has just moved in. Although there are only 5 spots in an apartment to look over when someone has just moved in, the order is seemingly random rather than the newest being at the top or the bottom. It is easiest to be able to look for the only "UNEMPLOYED" roommate. That is a minor inconvenience, but what is much worse is having to scroll through all of your bitizens when you are trying to put someone to work. If only one person is unemployed at a time (2 when you are doing the temporary shuffle) you just look for the single sad face in the bunch. In general, the fastest way to get a lot of coinage is to exchange 50 bux at the bank for 100,000 coins. 2000 coins per 1 bux isn't too bad of a deal, but it can be a grind to save up that many bux. It would be nice to get a similar exchange rate without buying in such bulk. Find a store with a third tier product that delivers in a multiple of an hour. Work hard to hire all dream jobbers (see my previous tip). Order the third tier product, and only the third tier product. I know, I know, it's crazy... Bare with me. Now, get to work on that elevator. Have you upgraded your elevator? Did you know you could upgrade the elevator? Check it out in the menu. It is expensive to do but ultimately worth it. All right, so you are working the elevator looking for the big buyer VIP to show up. You need to determine the type of VIP before you commit to giving them a ride. To do this, when a VIP shows up, you can tap the VIP button on the left to autoscroll to the bottom or do it manually. However, don't tap the VIP button on the right or the VIP themselves as that is what commits you to delivering them to a floor. The celebrity and the big buyer can be hard to differentiate because they both wear glasses, but the celebrity is more feminine with earrings, and the big buyer looks more like Bill Gates. If it is the big buyer, scroll up to the store in question, and hurry the delivery. Scroll back down to the big buyer, and take him to the store. Right now, it might not seem as though I am suggesting anything that special, but let me explain and do some number crunching. The reason I didn't use a conditional when discussing hurried delivery is that if it is already delivered, you aren't working the elevator hard enough (it's okay, you'll do better). Regardless, you can still make a fair amount of money if the stock is near full. I only ordered the third tier product so that VIP doesn't have a choice. You could stock the others, but then you'd have to quick sell them or gamble. I suggested using a store that delivers on a multiple of an hour because partial hours add a whole bux to an express delivery. Almost all remainders of delivery times that are not multiples of hours are 20 minutes or more. You will often find a big buyer in less than 20 minutes. This is not to say that 1 bux is going to make the deal bad, but it's all about diminished returns. You need 3 dream workers so that the quantity in the order is doubled. Okay, on to the numbers. I have been using the Racquetball Club where the third tier product is a tournament that has a count of 4500 and is delivered in 5 hours. Since I have 3 dream jobbers, the count doubles to 9000. Assuming that the big buyer shows up shortly after I make my order, I will have to spend 5 bux to rush delivery. Each unit costs 3 coins so the whole stock is worth 27,000 coins, and the big buyer has to pay that. 27,000 is significantly less than 100,000, but the important thing to consider is the amount per bux. One division later, and we get 5400 coins per 1 bux. That is a heck of a lot better than the bank, and I only had to use 5 bux vs 50 bux at the bank. The 5400 to 1 exchange rate holds true for all deliveries taking multiples of an hour. What varies is how much bang you get for each big buyer. I was lucky to get the Racquetball Club. This a way to help you make bux while you are not actively playing, but you are waiting for notifications. Instead of putting your device to sleep, leave the game on the screen running. Every few minutes, glance over to see if a find-the-bitizen task has popped up, complete it, collect your bux, go back to whatever else you were doing, and repeat. I have my device set to sleep after 5 minutes, and it seems that most of the time I will see the task pop up before it sleeps. If you miss one that pops up before the device sleeps it will still be there when you wake it up. Also, I just noticed that that particular pop up doesn't make any noise so there is no advantage to keeping the sound on if you only want to watch out for those tasks. By the way, I like the music, but it can get repetitive. I wish I could turn the music and the coin sound effect off separate from the other sounds. I hope at least one person finds something here helpful. Enjoy. i just finished the construction of a floor, and the shop wont come up it says that there is no construction time left, but it simply stays as a construction floor, what can i do??? and btw, any stocked floor doesnt need any employee to run, it will sell nonetheless. When you click on the floor, on the bottom left corner there's a yellow button that says delete. Does that delete the whole floor or just the type of floor it is. Like if I can change from a coffee shop to a Mexican restaurant. Carbonizer's tip about aggressively evicting and inviting tenants to get people whose dream job matches your tower is great. I have rapidly gone from a 8/40 ratio of dream jobs to tenants and now have 30/40. I am having an impossible job finding people to staff my pub, but expect to find them eventually. The 10 non-dream tenants are all in the recreation field, and I am one lower on Rec than the other floors, so I plan to build two Rec floors next, and hopefully will hit on a few of those 10 tenants. The rest will be evicted. As for tips, there is no penalty for wrong answers on the tenant search mini-game, so don't be afraid to tap if you can't fully see the people because they are hiding. You get 2 coins per floor for each floor you take a passenger on an elevator trip, so if you get a VIP you can't use, might as well take them to the top. For the celebrity VIP, I don't think there is a benefit to take them to a high stock floor as the items still cost 1/2/3 coins, so I would suggest taking the celebrity to a low inventory floor that you can refill quickly. Save the high inventory floors for use with the big spender VIP. When I delete a floor and rebuild the same category I always get the same type,.. Any Same expieriences? would it help to move the empty floor first? I've never seen a VIP get the floor bonus. Ah, you're right, Dani. Just checked and there are no coins for the VIP. For the Celebrity VIP, she generates sales of 50 items on each trip, so the maximum you can get is 150 coins if she goes to a floor with only the 3-coin items in stock. Not a huge windfall. dLR, I deleted a Pub, rebuilt it at the same location and got a Mexican Restaurant. Maybe you just had bad luck. How can you get people to move into the apartments without buying the tenants? When using the elevator bitizens will ask to be brought to a floor, if that floor is a residential floor, that has open apartments, the person will move in. So I started adopting the strategy suggested by @carbonizer above; selecting bitizens on their dream job matching what my tower could offer. This was at a stage when I had about 2 floors per category, which means that you have to be pretty lucky to find the right candidate. As suggested, I was spending towerbux to speed up the process of getting new tenants, but it turned out to be very ineffective. I spent 20 towerbux for finding maybe 1 match. Since I also wanted to save for elevator upgrades I decided this was not going to work. But the alternative, waiting patiently for bitizens to stop at my vacant residential floor in order to move in, was taking forever. - if a residential floor reaches 5 bitizens, evict 1 of the temps that doesn't have its dreamjob yet, so that your floor has always 1 vacancy until you have 5 dreamjob residents. - by maintaining this strategy, you drastically increase the chances of having new bitizens moving in spontaneously (for free), even with large towers, compared to having only one new residential floor fully vacant. - my tower has 19 floors, the bottom 7 are residential with 4 bitizens each. So each elevator job has a 7/19 chance of giving me a new resident for free that I can test for its dreamjob. I have 28 bitizens with 19 dreamjobs, still improving steadily and meanwhile saving for the elevator upgrades. p.s. who in the hell has their dream job at a laundromat?? ohhhh yea Hugh Watkins lmfao!!!!! Seems that the bonus for fully stocking a floor is 4-5% of the current stock on that floor OR a tower buck. I am not positive on the frequency of the tower buck, but it seems to be a pretty good percentage of the time (say 20-35%). Regularly stocking the cheapest/fastest item (like chips in the Mexican restaurant) isn't a bad way to earn tower bux if the 2/3-coin items are fully stocked. Honestly, I need this incentive as the profit margins aren't enough otherwise to justify fully stocking those floors. Oh, evil tip if you really want to finish a build is to reset your system clock a few days in the future. Of course, if you start a build or stock in the future and set the cloak back to the current time without finishing the build or stock, the time to completion will be really long as it wont complete until that time addedonto the future time, but this can be a useful tip if used sparingly and if you don't have problems with doing what is obviously cheating. > p.s. who in the hell has their dream job at a laundromat?? I want to know why the same poster is at the Cineplex and the Video Rental. Shut down those bootleggers now. I really like the Hang in There calendar at the Software Studio. Hey ... there is a new update... added 5 more business... please update the business list. > #18 ... Employing someone at their dream job also rewards 3 bux. Only 1 after the update. The one buck for dream jobs is painful. Being able to rename the businesses is cool. If you change all the names to something memorable (such as Asian Cusine becomes Noodles Etc.) Irishmen easier to recognize that a new tenant has a dream job of a business you already have. Oh, to help with locating people, you can name the business after a level-9 dream employee, such as Mel's Cakes. The various sort options for the lists of peoples very convenient. You no longer need to clear dialogue boxes to spend coins to restock or to acknowledge earning coins for things like the restocking bonus. Makes play much quicker. You also lose the bonus for fully stocking a floor. Thanks so much for the Google spreadsheet. Have all my businesses organized by time needed to restock--lowest at the bottom, highest at the top, residential above that. So much easier!! i have a little problem with floors and bitizens, which is the variety of dream jobs and therefore floors being built, which is very poor. everyone is superhappy with their dreamjobs and the floors just double (which means i get same kind of floors all the time), while i want some new stuff to build. like sushi bar instead of yet another bbq place. any advice, if anyone went thru a similar situation n found it as troubling as i do? The bonus for fully stocking is still there, you just don't have a box that pops up unless you get bux. It is about 4-5% of the number of stocked items. That sounds awful. I haven't had any duplicate floors at all, and I am at 60+. Have you upgraded to the new version and it is still happening? i mean, the game goes great, i get a lot of income and all that, but it's getting lame after a certain amount of copyfloors. i just built 4 new floors, and got 500,000 coins in a span of 4 minutes maybe :D i admit its cheating, but when you get to 40+ floors, the wait time for a floor to be constructed is almost 20 hours... who's gonna wait that long! i think one of the few bugs in the newer version has made its way into ur device... be patient, wait a few days, and download another update on the way that NimbleBit has already submitted to Apple... hope that would solve your problem! best of luck! does anyone know, what exaclty happens when you tap the reset button? Do your bucks and money remain or (like selling the tower) come back? 1- use the time to take advantage of the occasional bux for restocking. Instead of jumping far into the future, jump just far enough to quickly restock full floors in rapid succession. 2- move forward one day at a time, collecting birthday bux for each person. You will still get the bux on their real b-days too. I guess I'm only a mildly aggressive evictor... I rarely use the elevator for anything and use bux to fill my apts. Dream job is great, but don't want to waste all my bux... so I keep all new folks who have dream jobs, and then go back through all floors and check skill level of all the non dream job folks. Goal is for each floor to be staffed full and have at least one dream job and 8 or 9 skill for the non-dream job. That way you get the 3 bux (haven't updated), the stock multiplyer, and the highest discount for each restock (24-27%). If I can't meet that goal, the floor goes unstaffed (or remodeled) until I can meet it. So I am only evicting the ones who are not dream jobs and have no skill at a 8-9 (really, who wants a 0-3-5-0-2 anyway?). 36 floors, 28/60 dream jobs currently. making coins hand over fist. Has anyone mapped out to see if the name/dreamjob/skill combination is fixed (like stock and restock times) or if it's random for each player? In other words, is your Jimmy Hopkins the same as mine? Just wondering - like how many potential bitizens exist. You could set up an open google spreadsheet and people could post their bitizens and the stats. yes i've tried the reset button in the beginning, it works as if you have just installed the game for new. even the tutorial starts again. all money and stuff gone. im not planning on using the time jumping trick for stocks... just for constructing floors. stocks take maximum 6-10 hours and meanwhile others are at work. so no problem there. BUT..... what is a birthday bux? :S i've never heard/read/experienced it... elaborate please..
thats your way. but i have 65/75 dream jobs, and its like im stealing money :D it greatly increases your profits, well doubles it, so ofcrs. i still have 3 workers at each floor, and im constantly on the look out for dream jobs or higher skills to replace them if they need to be. i have atleast 20 perfectly employed workplaces out of my 25. 3 dream jobbers with a skill point of 9 each :D works like a charm! The birthday bux are kinda like the rent you collect. Each new day on the calendar that you open the game, you collect 100 coins rent for each of your bitizens. If the day also matches the birthday of any of your bitizens (I have 100+ so it happens frequently), you get a bux. If there are multiple bitizens with that birthday, you get multiple bux. Since upgrade, whenever I return to the app, following a period away, the music plays despite it being switched off in "Settings" To get rid of it I have to switch it on in settings and then off again. Anyone else have similar issue? Sometimes I have the music playing, but no sound effects. My setting for sound is "On." I time travel once a day, just before bed. My floors are at 1 day 15 hours to build--forever! I travel forward one day, collect coins and restock only the 2 coin items. Go forward one more day, stock the 2 coin and restock the 3 coin. Travel forward one more day and only stock the 3 coin items--NO restock. Go back to present day and restock 2 coin items. Plenty of coins while I sleep and the 2coin items are ready to go in the morning. Then I restock the 1 coin items. By the time I am ready to go, stock them, restock the level 3 and most of them are ready in the afternoon. As far as people, I keep all level 9 or dream jobbers that move in. If a place is full of level 9 dream job, I make someone unemployed just long enough to move the new one in and then evict them. When it is time for a new floor, if I do not have 3 unemployed with a dream job of the same category (food, service, etc. ), I build more residential. Otherwise, I build whatever I have three people to staff. The more residential you have, the higher your demand goes and it doesn't cost anything to have unemployed bitizens. My stats usually run between 800 and 1200 sales per miinute with only 48 businesses. Interesting observation that you can get more sales by having more residents. I have noticed my sales higher when I have only three coin items stocked and lower as I also stock ones and twos, which makes me think the demand per minute at each store is fixed in terms of number of items purchased, and you can maximize the income by only having the most expensive items. Have you noticed anything like that? I think I will focus on residential for the next couple floors and see what happens. so i guess you are right. but even if you stock only 3coin items, you still need to have employed 3 ppl there to make the third item available..
i too restock every item on the list for every floor, and my sales go somewhere around 600 per minute when every floor is up and running, with 30 business.. Does anyone have names of famous people? I have a F. Castro. That's Lizzie from the game Rampage. Can someone help a noob? I built my first unit, but no one moves in unless I use one of my bux. Then they are unemployeed and I never have rent to collect. What am I doing wrong? Ill keep trying, how long does it take to get rent? BBQ Place, Auto Dealer, Floral Studio, Rock Climbing, Recycling. do I need to update the game? 24 hours.. but you get 100 coins per bitizen, so the rent doesnt count towards much, in my opinion atleast..
few other people have the same problem btw..
Will not trust new update as last one took buxs from most riders instead of increasing them as promised, reduced buxs rewards for fully restocking, reduced dream jobs bux. If you remember there was an update before this one we were warned not to install. I am barely happy at fl 71, do not play as much, endless people searches only way to make alot of buxs. heyyy... for the list of VIPs, there is also a real estate agent who can move a new bitizen into a residential.. and the pink shirt bitizen who increases the number of customers is a celebrity. New update. Lots of goodies. Infini-Lift Lightspeed (Speed 42 ppm) for only 499 Bux. This is an unintended bug which causes sales to be slower while the app is open but sales are normal when running in the background. An update will be out soon to fix the bug. 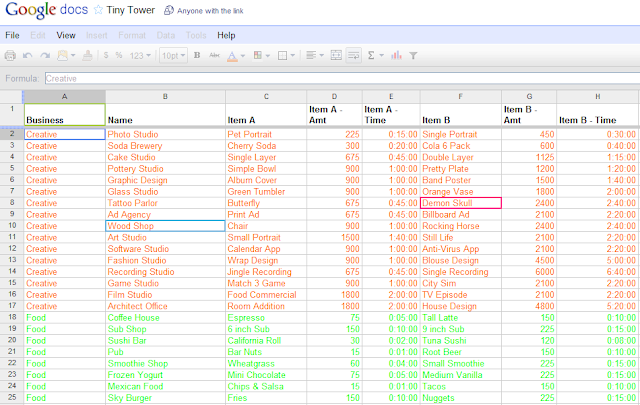 As of the Version 1.3 update, each commercial floor can be upgraded for 3 Tower Bux per level. Each level increases stock of each item by 75, the stocking time by 5 minutes, and the stocking price by 45 coins. There is no level cap. A strategy I find useful is to rename the business starting with the number of dream job staff in them. E.g on the golf business, if I have 2 staff employed where it is the dream job, I rename it 2 golf. That way when I get a new bitizen and his dream job shows 2 golf, I can know I have a spot for him. This is particularly helpful when the building gets larger. If there is 3 bitizens in their dream job, I rename the building as 3 golf, or if they are each skilled at 9 I rename it Full Golf so I know it is maxed out. If 3 Golf, I will replace a lower skilled dream job staff with a higher skilled one. Rename businesses to help u keep track of the occupancy and also help u distinguish buildings u have now from those not in yr building . I just stumbled onto something - not sure if it's a bug or a new feature. When I got the Real Estate Agent VIP, I took her to a newly created and empty residential floor and it put 5 new residents in there. I was able to score three dream jobs in one shot! Just thought I'd pass it along. Yes the Real Estate Agent now fills all vacancies on the floor. The bug that some people have reported is that the new residents all have the same dream job. *Do the time change trick? i used the skip time trick, but when i changed back to the original time, all the sales went to 0, is there a way to fix this? new to this, can anyone please tell me what the individual upgrade for each built floor is and how many it upgrades by, i have a couple of level 6 and dont know if ive been wasting bux? so meaning u can keep going upgrading them and they'll keep increasing, no limit. after you move in the bitizen from your buck, you have to start stocking the business floor, thats how you get more coins. keep moving bitizens up from the elevator, it will move new bitizens to your residential floor, which you can employ in your business floor and thus stock all three items. also you will get little missions to find people in your tower, since you have just 4 or 5 people it will be pretty easy to find one of them, that's how you get more bux.. collect 50 and get the 100,000 coins from the bank, that should help you to build more floors. thank you! i am enjoying the game! 7 more floors to go. there are more on the way. I have ninjas stocking sushi and pandas doing Asian. The bellhops became the ushers at the cineplex. I was happy when I thought of Knight Club. I was tempted to make it Pirate Ship & Print. The Milwaukee Brewers are at the brewery. I was most proud of abbreviating one business to FroGurt. The cats are stocking ice cream but cats and scoops bring a different image to mind. dark, and heavy for the foreseeable future. I may have missed this in all the posts, but is there any use for the basement? Also, is there any benefit to being connected to "friends" towers, or is it just to keep us competitive? basement or Lobby floor is just for the lift, when there's a passenger to be transported thru the elevator, anywhere you click on the lobby floor (including the elevator itself), you begin transporting the passenger to its desired floor. Xindagi : Yes, the new elevator is totally worth it, OMG. it is superfast but it also has super breaks, just the fact that I can go down one floor instead of two is worth the 499 bux, but the speed is also incredable. I also find that even at 2 bux per dream job, you can still make bux quite quickly if you play often, I mostly play while trying to fall asleep or on break at work. I get bux pretty fast. i agree on the fast bux, but to do so, you need to have atleast 50+ different business in your tower to make the dream job bux, otherwise you'll just keep getting bitizens who dont match any business in your tower. also, about increasing the level of the business to make them stock more, how are people going about it? do they increase the level of every business? or just those who stock real low amounts? i plan to increase the level of every low-stock business until the first item is being sufficiently stocked..
No customers are visiting my shops on tiny tower....therefore, i am not earning any cash!! Any suggestions on how to attract customers too buy and come to my shops?? hi!! i am just new in playing this game maybe some of you guys can help me with my query. i started palying the game aound 11pm and i have fully employed my sushi bar and my barber shop..
is that normal for the employee to stay in their apartment even if the store has a full stocks of products? I tried to make a residencial floor but the game said "no more types of this floor for your level"... What does that mean and how do you"level up"
One floor you forgot in the recreation.There is a haunted house! I am relying on my big spender to make money as it takes more then a day to make enough for a new floor. Is it worth spending bux to upgrade my courthouse which is my highest paying room with my big spender or is it a waste of my bux. Am I better off saving the bux to buy 100000 at a time with 50 buxs. I just looked at the floors with the lines running through them and all of them have dream jobs, though not all the dream jobs have the lines. I also found out if I go ahead and buy the product with biz it loads but then the next product chosen after that does the same thing and won't load. I have even tried rebooting the phone and that didn't work. Also on another update it would be nice if some one put a cancel button on product already being sold. Sometimes I accidentally brush it with my finger and then all I get to choose is sell or gift. I have found out rebooting my phone will put it back to normal but that gets tiring. CJ -- you don't have to reboot the phone. Go ahead and choose SELL or GIFT after accidentally choosing the options. You'll get a confirmation dialog where you can choose "NO" to cancel the transaction. Didn't see this one on the spreadsheet and I just got it on my Tiny Tower: Submarine Apts. I have a question for all you tiny tower experts .. Just started playing this yesterday and have 9 floors and 15 Bitizens. I have read almost all of the posts and although all of my 15 Bitizens are a 9 in the skill level job they are in none of the 15 have a dream job that I currently have. Do I just start evicting until I get someone that has a dream job for a business that I actually have? CJ - The only time I've seen green lines across a stocking business is if someone set the date or time backwards on their phone to before the stocking began, like if you told the shop to stock on Monday, April 2, then for some reason set the phone's date to April 1. Help! On my missions menu, it stays on that screen for about 3 seconds but then after that, i am taken to my ipod's main screen, exiting the whole tiny tower app! I have 159 floors and I'm trying to build another apartment but it keeps telling me I cant do this for this level. Why is it doing that? How do I rearrange the floors? Do I need money or depends on what level I am? Hi, I found a great way to organize my people so I can locate them when asked for a free tower buck. Whenever you hire someone just customize their clothing so their shirt color matches the type of floor they work at. Green shirts for food, blue shirts for service jobs, etc. That way when the blue square pops up at the bottom of the screen you dont have to search every floor to find the person, you know what job they have so you just need to serach those floor types or the apartments.